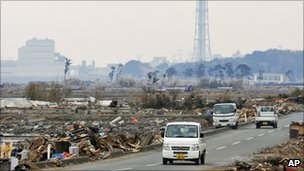 A maintenance worker at Japan's Fukushima Daiichi nuclear plant tells the BBC what happened when the earthquake and tsunami hit north-eastern Japan on 11 March. He asked the BBC not to use his name. When the massive earthquake occurred it was a little before three o'clock in the afternoon. The 31-year-old, who runs a turbine maintenance company subcontracted to work at the plant, was doing a regular check-up of the turbine in the No 5 reactor when the quake hit. "Heavy machinery, cranes were shaking above our heads. After about three minutes all the electricity went out," he told the BBC World Service. "The shaking went on for about five minutes, and it was very strong. "I shouted out my colleagues' names and used a torch to try and check that everyone was okay." The earth started shaking again and they all ran outside. When it was confirmed that everyone was safe, workers were given permission to go back home to their families. He got in his car and drove away as quickly as he could. "I knew there was a tsunami coming," he said. "I saw the warning on the TV in my car, about 20 minutes after the first quake." However, he said, the scale of it was totally unexpected. "Although the shaking was very strong, I did not predict the scale of the tsunami, I didn't imagine the power station would be damaged in the way it was." The man says workers were well aware that the plant, commissioned in the 1970s, was relatively old. "But even knowing that I did not think the plant would fall into a situation like this. "If it was only the quake, I think the situation would not so bad. But because of the tsunami, things like the emergency switches were destroyed." Once he realised that the nuclear plant had been damaged, the worker says his first priority was to warn his family and friends. "I knew that radiation affected people's health badly, and as soon as I knew that the radiation was leaking, I told my family and friends to escape immediately, as far away as possible," he said. But, he said, he would go back to work at the plant if he could. "If it was possible, I would go back and work there. But we cannot do anything. 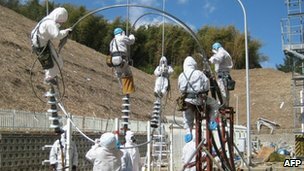 The people working at the site now are expert workers from Tokyo Electric Power (Tepco)," he said. "We want to go back and help the people working to manage the situation, to stop it getting worse. We cannot go back no matter how much we want to. It's frustrating, but we just cannot help them." He says he is aware there are health risks for those working inside the plant. "The situation is changing day by day. If they asked me to go back now, I realise there is a degree of risk." The worker says although he is prepared to go back inside the plant, he would not let his employees work there. "I am a boss of a company, and I cannot send in my workers knowing that the site is highly polluted." Despite the disaster unfolding at the plant, he says he doesn't blame Tepco, the company that runs it. "Although the situation is not good, they are working really hard to minimise the damage. It's nobody's fault, it's not Tepco's fault. They are doing their best to minimise the damage." Although he is currently staying with friends in Chiba prefecture, well beyond the current 20km exclusion zone, his house is only 3km from the reactor. He says he wants to go back home. "If possible I want to go back. There are a lot of memories there. I guess it's a common feeling for all people, to feel sad when you cannot go back to the home where you grew up. "I think if this disaster happened in another country, people would feel the same as we do."